A former photographer who never stopped dreaming in caught moments, director Stanley Kubrick made this movie about the moment at the End of Moments before he succumbed to a portfolio of futurist thugs, 18th-century opportunists, snow-bound haunted houses, psychoses in Southeast Asian jungles, and pornographic nocturnes. Few major movies so split perfectly intelligent people between those who think it’s visionary and those who think it’s claptrap; but even the visionary camp acknowledges a certain amount of claptrap and even the claptrap camp can spot the visionary. In either case, that 2001 is one of cinema’s landmarks is incontestable. 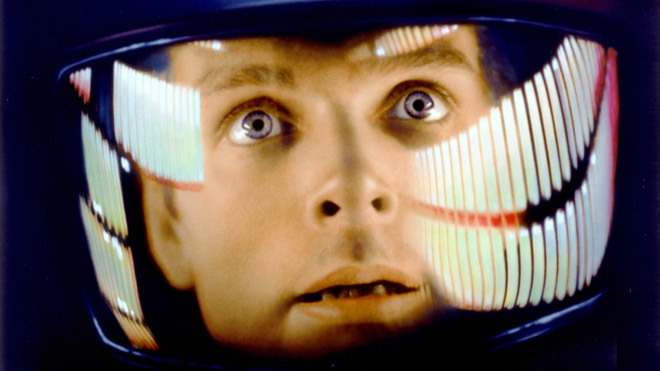 In Kubrick’s headlong pursuit of oblivion, 2001 took science fiction from the merely galactic to the defiantly cosmic, imprinting itself on the cultural consciousness that’s filled with moments (some caught and some unleashed) immediately recognizable to those who never have seen the picture: the flung skybound bone that—having just been used to commit the first murder—arcs into a space station; the towering black monolith that greets mankind at every quantum leap; the computer that speaks with unctuous malevolence; Strauss’s momentous theme music that announces a new age; the embryonic divine starchild that waits on the other side of the infinite. This film divided everything that preceded it from everything that followed. Previous articleChego Hits the Streets… er, the Parking Lot?